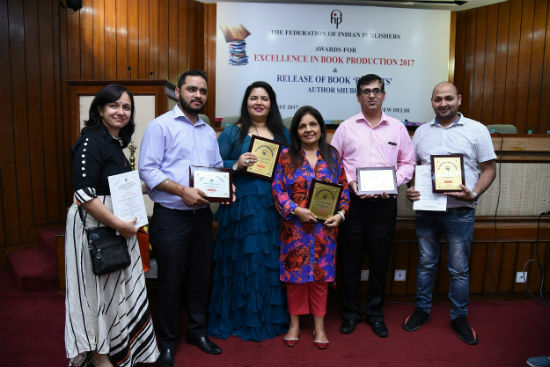 New Delhi: MBD group, the Education Company has won five awards at the recently concluded award ceremony for excellence in book production 2017 organized by the Federation of Indian Publishers. Ms Monica Malhotra Khandari, MD, MBD Group, received the awards from Dr. Mahesh Sharma, Union Minister of State for Tourism & Culture, at an award ceremony held on 31st August 2017 in Hall No.8, Pragati Maidan, New Delhi. MBD Group’s ‘New Learnwell Hindi Surabhi -Grade 3’ and ‘Integrated Social Studies- Grade 6’ bagged top prizes in the Text Books: School (Kindergarten to 8th) in Hindi and English category respectively. While ‘Modern’s abc of Science Biology Class X’ – English won second prize in Text Books: School (Classes 9th to 12th). Another MBD publication ‘Educating India’ also won top award in the Price Lists, Catalogues & Brochures (English) category. The ‘Learnwell Paryavaran Grade 2’-Gujarati, also won the second prize in Text Books: School (I) Primary and Upper Primary (Kindergarten to 8th) regional languages category. Speaking at the occasion, Ms. Monica Malhotra Kandhari, MD MBD Group said, “The awards are a fitting recognition for all the good work that MBD has been dong and continues to do in the field of education in India. MBD is the only publishing house in India with backward and forward integration. We are proud of our legacy of over six decades in publishing. At MBD, the focus is on creating a benchmark for the industry and these awards are testament to the success of our efforts”.